Welcome to my web home page -- a collection of my various essays on technology topics, comedy, my software, my popular amateur photography sub-site, and of course, an exercise in net.narcissism. Also found here are sites for some of my famous family members, with two books and a comic series. I also have a Blog called Brad Ideas. Today, I am frequently on the road speaking to conferences and companies, both on my own and through my affiliation with Singularity University, a school devoted to understanding and exploiting technology that changes in a rapid and accelerating way. You may know me because I was the founder and software architect of ClariNet Communications Corp., the world's first ever ".com" company (by which I mean a business based on the internet rather than one like uu.net which sold connectivity itself) and which was also the net's first and for a long time largest electronic newspaper. I founded ClariNet in 1989 in Waterloo, Ontario with the crazy idea of trying to make money publishing professional information over the net and to the net audience. It came to take up almost all my time. It became by far the largest paid subscription base on the net, and then In June of 1997, I sold ClariNet to Individual, Inc. which also publishes online news. I also have short bios for press and conferences. I left ClariNet in 1998 after Individual merged with Desktop Data to form Newsedge Corporation. Newsedge's strong focus on business news delivery is the right strategy, but I decided to take a new direction. Since then I've done various part-time projects, including a founding role in Topica and investment and advising for a variety of startups. In addition to the nonprofit boards listed here, I'm also on the technical advisory board of BitTorrent Inc., commercializing the most popular large file publishing software on the net. My current commercial project is writing and consulting about robotic cars including advising the team building these at Google. I'm also a frequent conference speaker. There have been lots of interviews with me in various magazines and web sites over the years, but the on-web copies tend to vanish with time, so just do a web search for "brad templeton interview" to find ones still around. You can also read how I was one of the plaintiffs in a suit against Janet Reno to stop the Communications Decency Act. I used to have a page of other press mentions of me, but as noted only a few of the links inside it are alive. In the naughties, I became fascinated with self-driving cars; first because they are a super-cool technology, but later because my research revealed the truly immense numbers around cars that will be changed. I decided they would be one of the largest computer-driven disruptions of the near future. I have made a large series of essays about them as well as a robocar blog. I've been giving talks around the world and consulting for Google's team. I'm Chaiman Emeritus of the EFF, the leading foundation protecting liberties and privacy in cyberspace. (I was chairman from 2000 to 2010 and on the board for around 20 years.) You've probably heard of the EFF, and perhaps think that because of how it was founded that it's funded by rich benefactors. Today it stands on its own and needs the support of members and donors large and small. If you support what the EFF is doing to protect freedom of expression, privacy and civil rights online, then do something about it. Visit the EFF Web site, and at the very least join. If you can, donate -- funds are urgently needed right now. The past couple of years have been terrible for charity fundraising due to the market and it's hurting us. If, like some high-tech folk, you still have stock with unrealized capital gains, ask about the stock-donation program that can get you up to a double deduction on your taxes. Please read my letter about supporting the EFF. I am also on the board of the non-profit Foresight Nanotech Institute, the leading advocacy and watchdog group for molecular nanotechnology, founded in 1986 by the field's pioneers. We also focus on futurism and AI. In 2009, a new school designed to offer a multi-disciplinary graduate program about the coming 5-15 years of exponentially changing technology was created. Founders included Google, Autodesk, Cisco, Genentech, Nokia, Kauffman, Peter Diamandis of the X-Prize and inventor Ray Kurzweil, as well as NASA Ames, where it's hosted. You may also know me because I started the net's most widely read newsgroup, rec.humor.funny. RHF is a moderated newsgroup devoted to comedy. Each day, what people estimate are a half million readers send in the lastest (and not-so-latest) jokes they have heard. The moderator picks just the very best and sends them back out the newsgroup. I edited it until 1992, and then passed that task on to Maddi Hausmann, who was followed in 1995 by Jim Griffith who ran it until the late 2010s. I maintain it now, though it's in disrepair. A rec.humor.funny home page describes some of my adventures as one of the first people to be banned on the net. RHF articles continue to be the most widely read thing on the internet and USENET today. For a few years I also did the same thing on the GEnie online service, known as the TeleJoke Round Table. That stopped in 1993. In its way, rec.humor.funny was also what led to the creation of ClariNet. Due to RHF and other matters, we sued the Justice Dept. to get the Communications Decency act declared unconstitutional, and we won in the supreme court. I've also published several jokebooks with material from rec.humor.funny. These can still be ordered, and you can find out about them here. I've also released a new compilation of the very best from those books, plus some more in The Internet Jokebook from Peer-to-Peer publishing. I'm also a science fiction publisher. In 1993, in a venture into electronic books, I published what was (and as far as I know still is) the largest anthology of current fiction ever published. The Hugo and Nebula Anthology 1993 contains the complete contents of all of the nominees for the Hugo award that year, plus all the short fiction nebula nominees. These are SF's top awards. The anthology, which is available on CD-ROM (and was available on the net for a time) contains all the novels, all the art, all the other fiction and fan material, plus author photos and videos and a hypertext annotated edition of one of the Hugo winners, A Fire Upon the Deep by Vernor Vinge. Please note most new essays show up in Brad Ideas, my blog. Through ClariNet, I've provided financial support for the development of C news and the TRN newsreader. Below you will find more about the software I've written and designed. Solutions to the Copyright Crisis - an examination of the proposed answers from all camps to the crisis in Copyright. Essays on Junk E-mail (spam), how to fight it, how not to fight it, and how the fight relates to important issues of net governance. How to fix the Domain Name System by not having generic TLDs. How to solve the problem of paying for content in an online world by using Microrefunds and the "Don't Pay" button. A Watched Populace Never Boils, a defence of privacy. A History of the word "spam" on USENET and reflections on the 25th anniversary of the first spam. Free Dmitry Sklyarov, from the viewpoint of one of the earliest ebook publishers. The Bill Gates Wealth Index, a hyperbolic look at the meaning of 40 billion dollars. TIPS-TIPS -- a form to report the citizen spies in Operation TIPS. Larry Ellison's new National ID Card. No Award a lightly humourous science fiction and time travel story set in something analagous to an SF convention. Darth-Darth Binks, Sith Lord. Hey, accidents are always happening around him. He's strong with the Dark Side of the Force. 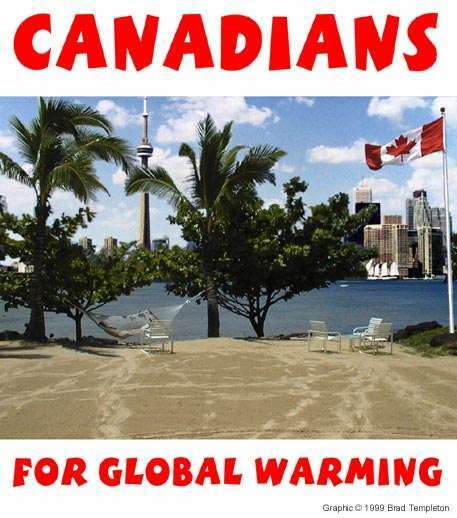 Canadians for Global Warming emblem. We're doing our best to help the greenhouse gas "problem." with my designs. If we're lucky, our pets will keep us as pets, an essay on how the first super-beings may descend from apes instead of humans. A bold proposal to build a ship of Tech-Nomads that wanders the world but is always on the internet. The future of TV commercials and hard disk video recorders like the Tivo. MythTV projects and other essays on TV and Media in a new section of their own. How to make all our E-mail private again with opportunistic encryption. How to solve sysadmin and upgrade problems in modern operating systems. 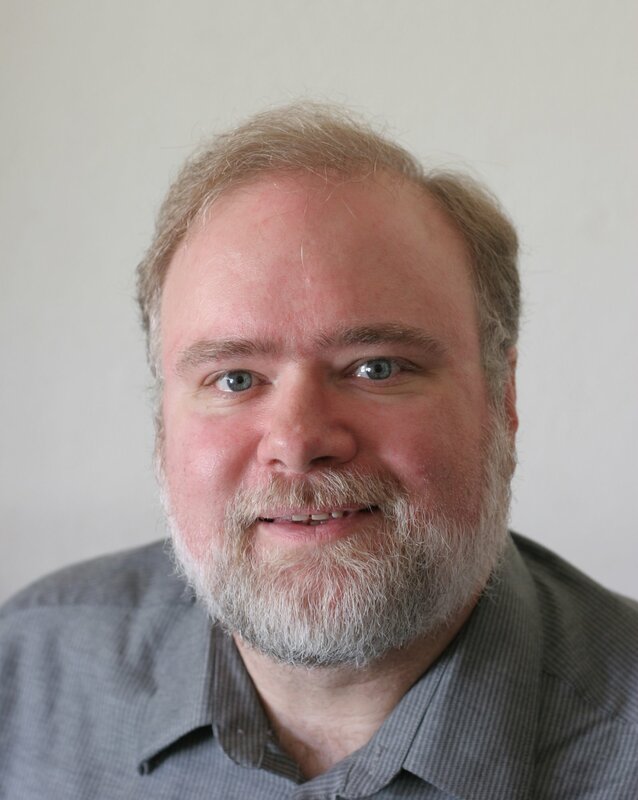 A conceptual draft for Out-of-Band SGML/HTML/XMLs which are a way to provide rich text HTML documents that look like plain text to plain text viewers. USENET Format Working Group notes and drafts. Ideal Audio-Video System design and why the Broadcast Flag makes it illegal. K News -- an obselete proposal from 1983 on news indexed by keywords instead of newsgroups. People propose things like this today, but now I know that they were wrong, as was I. Guide to Irving Street/Sunset Restaurants in the outer Sunset district of San Francisco. Note that I have a full secondary website for my panoramic and general photography, which is my biggest hobby. Around the World in 14 days, an account of how I circled the globe in July 1995 to visit Hong Kong, China and South Africa, including political commentary on my impressions of South Africa. With 7 (mostly safari) photos. The giant (21633 x 1024 pixels) panoramic photo of Burning Man 1998 along with 70 other photos in a BM photo-essay. Compare Digital and 35mm photography in my discussion of the tradeoffs between these two methods. Not my photos, but I built a page linking all 788 Unesco World Heritage Sites to Google Satellite Images to browse and enjoy. If I really did it, probably the thing I did that became the most famous was being the first to suggest that internet addresses be in the form site "dot" toplevel-domain, a convention that has now become recognized all around the world. I also proposed and developed the trial newsgroup system for creating newsgroups -- an alternate to "voting" that was approved in 1991, but alas that's when ClariNet took over my life and the work was never followed through on. In my early days in the microcomputer industry, I started out as the first employee of Personal Software Inc., which you may know by its later name of VisiCorp. The primary compressor in Stuffit, the most popular compression software -- actually the most popular non-Apple program of any kind -- on the Apple Macintosh. In my spare time outside the net, I'm involved in photography, writing, acting and singing in amateur theatre. I graduated from the University of Waterloo, and was for 12 years an active member of the FASS Theatre Company there. Other interests include music, astronomy, cryonics, film, government, philosophy and politics, bicycling, debate and hiking. I even got to have dinner "with" the President of the United States once. Personal Data: Born in 1960 to Charles Templeton (1915-2001) and Sylvia Murphy. Family: Tax law expert Mike Templeton, comic book artist Ty Templeton and TV producer/host Deborah Burgess. [Unique Family Portrait]. I don't have time to answer all the copyright questions people send, so if you send one you will get no reply. I feel bad about it but that's how it has to be. Yes, this really means you. No, I don't "trade" links, or sell them. I will accept sponsorships not done for SEO.